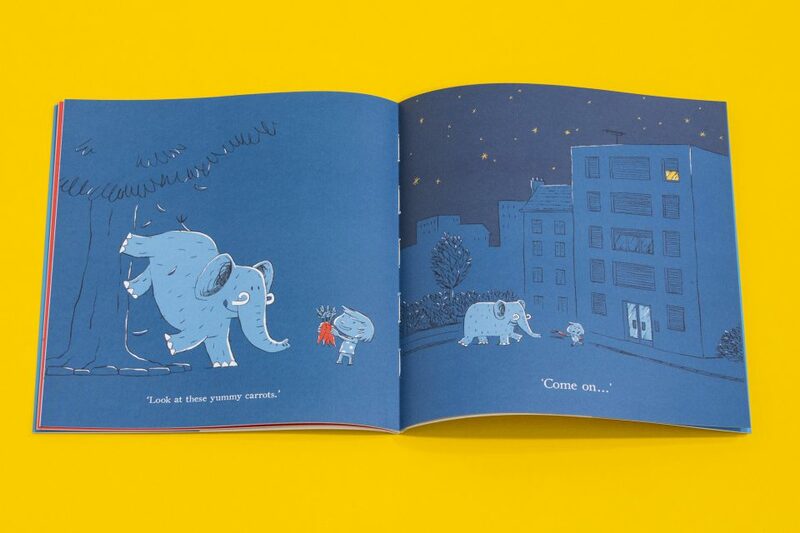 Match a surprising story with cool cartoons and primary colour bursts and you have a bedtime (well, any time) winner. is too strong. It’s sitting in the fridge! 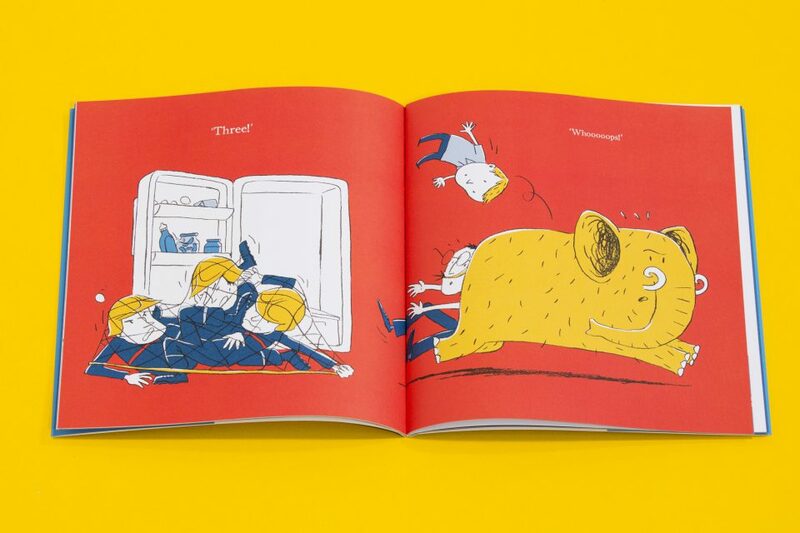 A Mammoth in the Fridge is a hilarious picture book with a surprise twist at the end! This delightful picturebook chronicles the adventures of a stubborn mammoth who evades capture at every turn. Simple and expressive drawings lend an immediacy and mobility to the illustrations… The last page is a surreal delight, and immensely satisfying. Funny and cute in equal amounts… A crazy and slightly surreal situation that breaks out into belly laughs later on as you figure out the twist for yourself too. I give this book four stars… My favorite part is when the net falls on the firemen. This amusing and absurd book gains much of its humor from Maudet’s action-packed pencil drawings, colored in stylish blocks of intense orange, blue, red and white. Another delightful offering from the wonderful Gecko Press… Engaging and expressive illustrations with minimalist colour palate accompany this simple amusing story. It’s the sort of over-the-top humour which kids will enjoy – especially the failure of those in authority – parents and firemen. A family is surprised to find a mammoth in the fridge …! 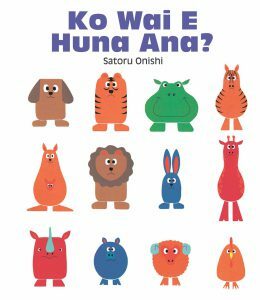 This book is a good shared reading book as it provides opportunities to teach children pre-reading skills. The words on each page have been kept to the minimum [and] questions … can be asked to stimulate the child’s imagination, discussion and predictive thinking … appreciated for the opportunities it provides for child participation in shared reading. Yes, it’s true. There is a mammoth in the fridge. At first Dad doesn’t believe Noah, but there’s no mistaking the evidence. Mum calls the fire brigade, who arrive helmeted and brandishing a very large net. But our slippery mammoth isn’t going to fall for that. He explodes from the fridge and rushes past his would be captors, straight up into a very tall tree. What to do now? How do you tempt a mammoth out of a tree? Maybe Noah’s little sister knows the answer. It’s enough to give anyone a shock. Finding a mammoth squashed into the fridge becomes quite a headache for the unlucky family he visits. 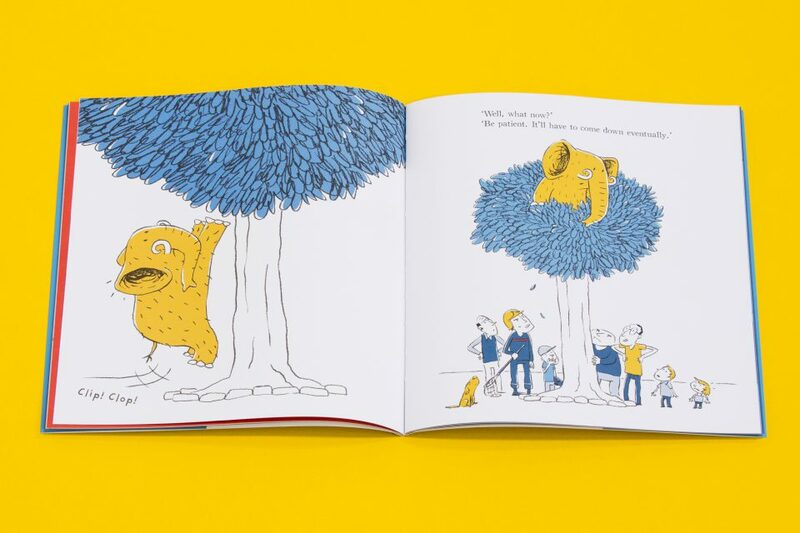 … All the fuss startles the poor mammoth, who escapes out of the apartment … The harried beast takes refuge in a tree … and eventually the [would-be captors] lose interest and go away. The mammoth is left in peace. Then a shadow creeps across the path below and catches his attention. A surprise revelation will leave readers smiling. A lovely little book aimed at 3 year olds and over but also nice for those at school learning to read. It’s short and funny, so won’t lose anyone’s attention, and has a great twist at the end. Noah discovers a mammoth in the fridge. At first his father doesn’t believe him. but when he sees the mammoth for himself the fire brigade is called. The mammoth slips past their nets and hides in a tree. Where did the mammoth come from.you had better ask Noah’s little sister! 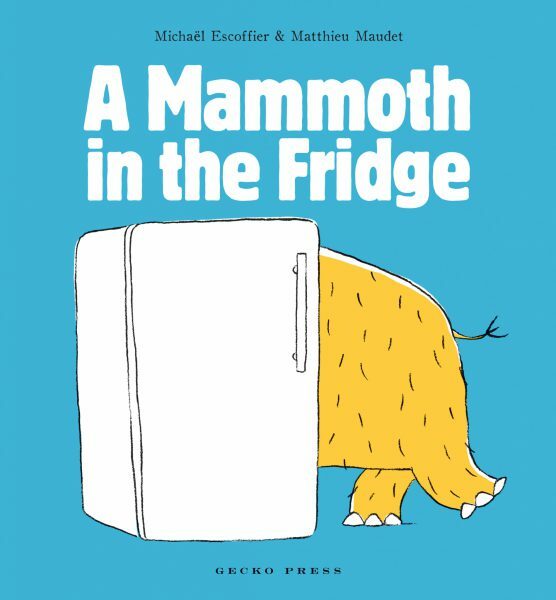 If you find a mammoth in your fridge, there are two questions you should ask: ‘How did it get there?’ and ‘How do you get it out?’ This hilarious picture book has a surprise twist at the end. Yes, there really is a mammoth in the fridge – everyone can see it as it eludes the efforts of the fire brigade and makes a break for freedom where it climbs a tree and refuses to come down. It is over to Noah’s little sister to lure it down at dead of night with carrots and soothing words – and it is the little sister who holds the clue to the happenings. It may take some children a while to work out the story behind the story but they will have a lot of enjoyment doing it. Simple text and beguiling illustrations add to the fun. The final scene is just lovely. This book oozes Gaelic charm and humour. 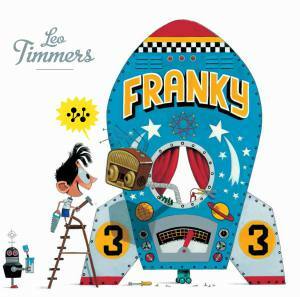 Gecko Press has another tantalising tale to tempt your preschooler…just wait for the punchline. A Mammoth in the Fridge will appeal to every person with a sense of the ridiculous and an appreciation of good plotting. Not to mention a taste for clever surprises. The text is sparse, complemented by expressive, limited palette line drawings, rendering a timeless quality suitable for all ages. Did I mention it’s funny? Just perfect for a quick giggle before bedtime, not to mention a perfectly weird introduction to the woolly mammoth. A simple story with a delicious twist…The book is sweet and humorous and although the images seem simple, you’ll want to go back and check the details when you’ve reached the end. My three and a half year old is exactly the right age for this book and we read it twice in a row tonight. It’s going to be one of those books.Gorgeous, gorgeous, gorgeous. Colourful illustration with short sharp text that’s easy for young readers to follow. A funny and unexpected ending will have readers returning to the beginning. I love the expressions on the faces of these characters. 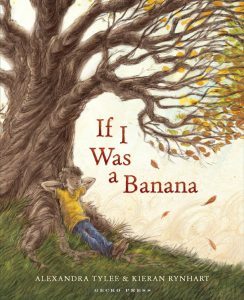 This is a delightfully simple story with a super-sweet twist. 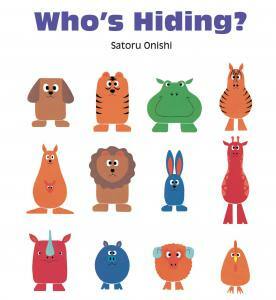 It contains cute and appealing illustrations all vibrantly done in shades of blue, black, white, yellow and red. Highly recommended. 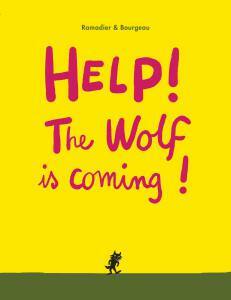 An unlikely story for young readers with a fantastic twist. It is very funny, and delightfully shows how we can sometimes be so focussed on an immediate problem to look at wider issues like how did a mammoth get into family’s fridge. It also portrays the trait that many of us have for passing really large problems off to others as soon as possible. The twists in the book will mean that it is read more than once as readers look for clues in the pictures. The illustrations are charming using a hand-drawn pencil look, and limited colours, reminiscent of children’s books from the ’50s and ’60s. The story relies on the illustrations; there are no superfluous words, so parents may need to explain a little to very small children [but…]I love it that the child needs to think about what is happening and who is doing the talking. …perfect for a child who is just starting to read. A deceptively simple story with a surprise ending … The ending left me with a smile on my face and children will love it too. My grandson aged 5 just loves this story. Wanted it read every night.